Marco Asensio (Spain) fails to produce a decent cross from the corner kick. The ball goes well out of play. Marco Asensio (Spain) sends in a lofted cross from a mid-range free kick, but his poor effort goes out of play. Sergio Canales (Spain) takes the corner kick and sends a lovely ball into the penalty area, but the opposition's defence is ready and knocks the ball to safety. 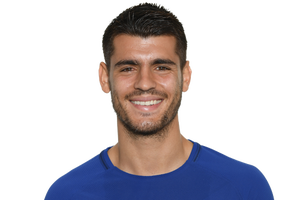 Alvaro Morata (Spain) receives a delightful pass inside the box and smashes a low shot into the bottom left corner. What a clinical finish! Alvaro Morata (Spain) is offside and the linesman raises his flag. Some neat passing and movement from Spain as they ping around some short passes in order to create a new attacking opportunity. Sergi Roberto plays a through ball to Saul (Spain) inside the box, he has time and arrows at shot that just goes over the bar. That really was a good chance! A spell of possession for Spain in an attempt to control the game. Saul (Spain) receives a precise pass on the edge of the box and bends his effort inches wide of the left post. Sergio Ramos (Spain) sends a beautiful cross into the penalty area, but the opposition's defence manages to clear the ball to safety. Andrew Dallas blows his whistle and signals a foul after Alvaro Morata (Spain) brought his opponent down. Saul (Spain) escapes his marker to meet a cross and heads to the middle of the goal, but the keeper pulls off an excellent reflex save to deny him. Malta will kick the game off. Andrew Dallas is introduced as the referee for today's match. Hello to all football fans, we are here to bring you a live commentary of the following match, describing all the most interesting and important moments. We'll make sure you won't miss a thing, so just sit back and have fun.